Published: Oct. 2, 2016 at 11:54 p.m. Updated: Oct. 3, 2016 at 06:24 p.m. 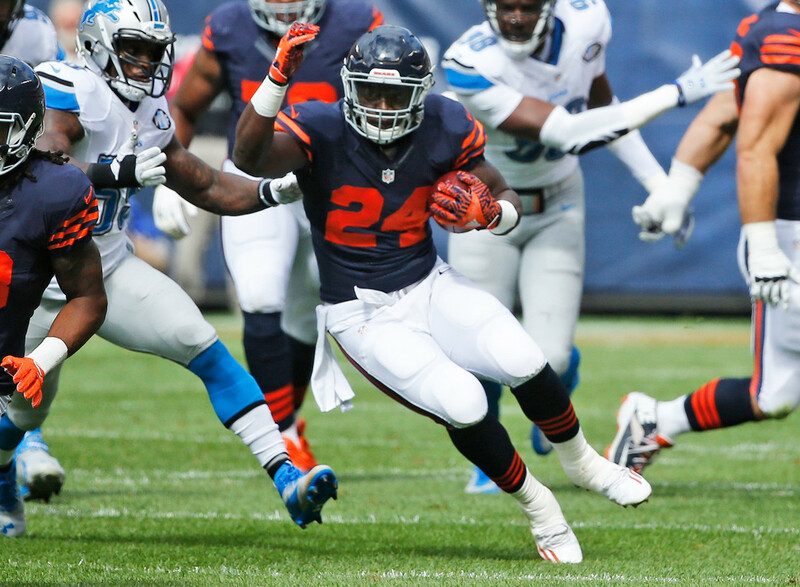 The waiver wire is one of the most important keys to finding success in fantasy football. I'll do my best to help you manage it and find the players who can bring you fantasy glory each and every week. If you play in a deeper, more competitive league, and all 16 of these players are already owned, be sure to check out my weekly "Deep Dive" waiver wire column (read it here) for some high-upside players to aim for heading into Week 5. And for those who use the Free Agent Acquisition Budget (FAAB) system, I provide a suggested spend for each player at the end of their analysis. If you have more specific FAAB questions, hit me up on Twitter. Howard nailed his first full audition for the featured back role in Chicago, taking his 23 carries for 111 rushing yards (4.83 ypc) and adding 21 receiving yards on three catches. With Jeremy Langford on the shelf for several more weeks, it appears Howard will have a sizeable weekly workload fantasy owners can rely on. While Howard's 23 carries on Sunday are three more than Langford's career-high, Howard has more career 100-rushing yard games than Langford and has averaged 4.8-plus yards per carry three times in three career games, something Langford has done just twice. These are tiny sample sizes so we need not draw conclusions that are to be written in stone, but it sure looks like Howard will not only see a heavy workload, but be able to produce on those touches as well. FAAB suggestion: 30 percent. Matt Forte was seen on a cart heading for the Jets' X-ray room after the Week 4 loss to Seattle, but there have been no details on his injury yet. Nevertheless, Powell needs to be a priority add this week based on his recent performances and the chance that Forte suffered an injury that could cost him playing time. Over the last two weeks, Forte has managed just 107 yards on 33 touches, while Powell has amassed 151 on 20 touches and has seen more than twice as many targets in the passing game as Forte (16 to 14). If Forte misses time, Powell would likely inherit close to a featured-back workload in an offense that, while sputtering, can still move the ball. He'd be an RB2 at worst if Forte were out. FAAB suggestion: 15-20 percent. After West out-performed Justin Forsett over the first three weeks on far fewer snaps, the Ravens turned the starting running back duties over to him against the Raiders in Week 4. He delivered with 113 yards and a touchdown on 21 carries for a 5.38 ypc average -- a vast improvement from the collective 3.39 ypc the duo averaged in Weeks 1-3. A quality outing such as this likely earned West the opportunity to keep his leading back role next week against Washington, meaning he should be added in all formats. However, don't go crazy with FAAB as the next player on this list might have something to say about West's role and workload as we get deeper into the season. FAAB suggestion: 15-20 percent. Fourth-round rookie Kenneth Dixon shined in the preseason, until a torn MCL left him in the training room for the first month of the season. Well, Dixon is set to return soon and the team is excited about his potential. Dixon is purely a stash-worthy waiver target for now, as there's no guarantee he earns a role out of the gate, especially after West's impressive performance. However, his soft hands and shiftiness in space could help fill the current lack of a dynamic pass-catching back in the Ravens' offense. Collectively, West, Forsett and Kyle Juszczyk have amassed just 167 yards on 36 targets (4.64 ypt). FAAB Suggestion: 5-10 percent. Sproles is coming off his bye week and into a matchup with the Detroit Lions. Depending on which Lions offense shows up (the powerhouse unit in Weeks 1-3 or the lame duck from Week 4), this could turn into a Sproles-heavy game script. He'll be a risky start, but if his volume in the passing game remains elevated (team-high six targets in Week 3) he'll at least offer a safe-ish floor in PPR formats. Grab him while he's under the radar, as Philadelphia seems inclined to use a backfield committee, even once Ryan Mathews gets back to full health. FAAB suggestion: 5 percent. While he wasn't used in as many gimmicky positions and formations (just one rush attempt as the quarterback) as last week, Pryor proved again that he's an NFL-caliber receiver, and one who needs to be owned across all fantasy leagues. Pryor hauled in five of his nine targets for 46 yards and a touchdown, often beating Josh Norman in coverage, too. Yes, he's on the Browns which will undoubtedly sour some fantasy owners, but Pryor is almost always the best athlete on the field at any given time and is demonstrating impressive levels of positional technique with each passing week. Go get him while you can, as he'll continue to see a high amount of targets until Corey Coleman returns. FAAB suggestion: 5-10 percent. I guess this is a lesson in never counting Steve Smith Sr. out of a fight. We were all rooting for Triple S to return to action and produce for the Ravens, but at 37 years old and coming off a torn Achilles, the deck seemed stacked against him. Well, it appears Smith hasn't lost a step, as he's seen 11 targets in each of the last two games, bringing in 16 of them for 198 yards and a touchdown. Smith has returned to his role as top dog in the Ravens' passing attack and fantasy owners need to pay him due respect -- by adding him this week off waivers. FAAB suggestion: 5-10 percent. With Eric Decker sidelined with a shoulder injury, Enunwa stepped into the No. 2 receiver role, leading the position in snaps (94 percent) while quietly contributing with six catches for 60 yards (seven targets) against a ferocious Seattle defense. Enunwa could see even more work next week when the Jets travel to Pittsburgh, a team less likely to push the Jets' offense around as the Seahawks did. We've been writing about Enunwa all season, as he's locked in as a constant contributor for this offense. Make sure his contributions start counting for your fantasy squad. FAAB suggestion: 5-10 percent. Agholor isn't seeing a ton of volume so far in 2016 (averages five targets per game) and has only found the end zone once, but Week 5 could be a chance for him to produce solid fantasy totals. On the season, he's played 46.3 percent of his snaps lined up on the left side of the field, which would allow him to avoid Detroit's top corner Darius Slay for a fair amount of the game. Without Ezekiel Ansha to help rush the passer, the Lions secondary was just picked apart by Brian Hoyer to the tune of 38-of-36 passing, 302 yards, two touchdowns, and zero interceptions. If the Eagles can provide Carson Wentz with similar safety in the pocket, he should be able to do work against this unit as well. Agholor looks like a nice sleeper play as a WR3 or flex this week and is available in plenty of leagues. FAAB suggestion: 5-10 percent. Williams led the Chargers in targets in Weeks 2 and 3, but lost the title to Dontrelle Inman in Week 4 (eight to 11). Still, he's one of the team's primary options in the red zone, with six targets in that space through the first three weeks, even though he's yet to score inside the 20. The Chargers face a still suspect Raiders secondary in Week 5, making all of the members of their passing attack worth a look in fantasy. For now, Williams should be the add above Inman after averaging just shy of eight looks a game since Keenan Allen's season-ending injury. I'll have more on Inman in my waiver-wire "Deep Dive," published Mondays. FAAB suggestion: 5-10 percent. It pains me slightly to be writing about Terrance Williams, a perennially under-achieving player, but with Dez Bryant sidelined Williams is worth a look. Over the last two weeks he's caught eight of his 10 targets for 132 yards with one touchdown and a lost fumble. He hasn't assumed a full No. 1 wide receiver role in Dez's absence, as Brice Butler saw a team-high nine targets against the 49ers, but Williams' big-play potential and rapport with Dak Prescott make him the slightly better add. We still don't know how long Bryant will be out, but with Prescott keeping this offense extremely relevant it'd be wise to add a player like Williams who has a chance to see WR1-levels of passing volume. FAAB suggestion: 0-5 percent. Originally it seemed as if we should ignore the Bills passing attack sans Sammy Watkins, but over the last two weeks Woods has emerged as someone worth our attention. While he hasn't found the end zone, he's seen 28 percent of Tyrod Taylor's targets and accounts for 38.4 percent of the team's passing yards in Weeks 3 and 4. Of course this isn't an extremely high-volume passing attack, but Woods offers a nice floor in both standard and PPR leagues for those who will be short at wide receiver with four teams on byes in Week 5. The Rams have allowed over 305 passing yards per game since their Week 1 blowout of the 49ers, so there are cracks to be found in an otherwise solid defense. FAAB suggestion: 0-5 percent. So far, Henry looks every bit the heir apparent to Antonio Gates in San Diego. Over the last two weeks (with Gates sidelined), Henry has caught nine of 12 targets for 163 yards and a touchdown. The Chargers have looked to him plenty in the red zone, too, though he just missed a second touchdown in Week 4 against the Saints. Next up for Henry is a date with the Raiders, who prior to Week 4 had given up a whopping 17.5 yards per reception to the position (and still allow 14.6 ypc after an uninspiring performance from Dennis Pitta and Crockett Gillmore). With Gates' status still in question for Week 5, Henry is a TE1 until further notice. FAAB suggestion: 10-15 percent. Starting the plodding Richard Rodgers isn't a very exciting venture in fantasy, but he's heading into an ideal matchup and won't be competing with Jared Cook (ankle) for targets. Aaron Rodgers has thrown 21.3 percent of his targets to the tight end position through three weeks, so Rodgers could see plenty of volume against the Giants. If the Packers deploy Rodgers up the middle of the field, where the Giants have struggled in coverage, he could turn in a solid streaming performance. With Travis Kelce, Jimmy Graham and Coby Fleener on byes, plenty of owners will need a tight end and Rodgers is in a good spot to produce. FAAB suggestion: 0-5 percent. The beginning of Wentz's NFL career has gone better than even the most optimistic expectations, as he's completed 64.7 percent of his passes for 769 yards with five touchdowns and zero interceptions. Heading into Week 4 he was the QB11 averaging 17.62 fantasy points per game. Heading into Detroit in Week 5, Wentz could be a top streaming option among quarterbacks facing a pass defense that has allowed 963 passing yards and eight touchdowns over the last three weeks (to Marcus Mariota, Aaron Rodgers and Brian Hoyer). If Wentz simply maintains the competent level of play he's displayed thus far, he'll be able to post solid totals for fantasy. FAAB suggestion: 0-5 percent. It won't be pretty, but those desperate for a streaming quarterback could look to Hoyer next week against the Colts. In two starts this year, he's completed over 68 percent of his passes with four touchdowns and no interceptions. Of course, with Hoyer the risk of a meltdown game is always high, but against a leaky Colts defense he should be serviceable at the very least. FAAB suggestion: 0-5 percent.